Ice fishing is a blast. There’s nothing else quite like getting out on the ice, boring a giant hole in it, sitting in the cold while sipping on something warm (or heavily spiked), and bringing in the fish. It may not be everyone’s idea of a good time, but it’s surprisingly relaxing, and despite its reputation as a difficult-to-master form of fishing, you can have really good fishing results once you master a few basic techniques. We’re going to take a look at the best types of ice fishing lures on the market today, discuss some techniques for using them and provide you with some product recommendations to get started. Whether you’re an experienced ice fisher, or you’ve just purchased your ice auger and are eager to get fishing, December style, you’ll be sure to learn something from this article. Let’s get to it. Berkley Powerbait 3/4 inch 1/32-oz. Ice fishing is significantly different than free-form fishing, so there are certain types of lures and baits that simply won’t work. Crank baits, for example, could have decent results in theory, but can’t really be used, as they’re only really effective when they’re pulled over a long distance, attracting prey with their realistic movements and rattlers. Standard spinners also suffer from this problem - they thrive when you can quickly move them, flash fish with the spinners, and draw them in from distances. So here’s a quick list of lures you should be using when ice fishing. While spinners may not be great ice fishing lures, their close relatives, spoons, are quite effective. This is because, as contrasted to spinners, spoons have a lower profile, a simpler, integrated design, and they’re easier to “dance” by dropping them straight down and pulling up with quick, jerking motions. While spinners need a larger area to be effective, spoons can be quite effective even in the stationary ice-fishing style. You’ll want a spinner that’s large and bright, generally, as it needs to be able to attract faraway fish. Yep! Despite many ice fishers saying the opposite, a standard swimmer diver can be used as a jerkbait to attract plenty of fish while ice fishing. This technique has recently grown in popularity. Simply, you’ll want to get a lure that you can sink to about 5-7 feet off the bottom of the water, and it should be lightweight and responsive both to water currents and your movements, because it will be used more like a deep-water surface floater, not like a standard swimmer that attracts fish over long distances using its swimming action. ​Once suspended, you should do your best to move it by jerking your rod consistently, but you should vary your timings and the magnitude of your swings, which better mimics a live fish. Bladebaits can be thought of as a great combination of standard jerkbaits/swimmers and spoons/spinners. Sadly, they’re often overlooked in standard fishing applications for their single-purpose brothers such as spinners, crankbaits, and swimbaits. These flashy, shiny-bladed lures imitate the profile of a fish but are made of out the same mirror-finished material that spoons are, so they can both imitate the action and appearance of a live fish, yet also attract prey from longer distances with their bright, flashing presentation. If you’ve done the math here, you’ve probably realized that makes them perfect for ice-fishing applications, where the main problem is simply attracting fish to a stationary position. And you’ll find great success with blade baits. We recommend any aspiring ice angler keep a blade bait or two in their tackle box and break it out when they’re having trouble bringing in fish with their other baits. It’s not guaranteed to be 100% effective, but its combination of flash and form make it great for attracting fish under the ice. If you’re talking a true ice fishing classic, that’s a jig all the way. Used for decades as the premier lure option for ice fishing, there’s a reason that the humble jig has endured the test of time. Grab your favorite ice jig, slap on a worm trail, and sink it through the ice to the bottom floor. It can be a bit hard to master the stationary jig position, but what you want to do is “dance” the jig just on the bottom of the water, kicking up the tail and hook while disturbing some of the floor and kicking up some dust and mud.
. This imitates perfectly the action of small baitfish and other common quarry of your target fish. It can be tough to figure out the specific ice fishing jigging action, especially if you’re used to jigging over long distances across varied terrain in larger lakes and rivers, but once you do, you’ll reel ‘em in like nobody’s business. And if you’re ever having trouble reeling them in, try pairing them with some live bait! Sometimes nothing beats a real meal stuck on the end of your hook.
. Adjustable for either deep or shallow flotation, it comes with two hooks, central holes for jigging, and a great vibrating action that’s sensitive both to movements from the angler and strikes from fish, it’s ideal for ice-fishing applications. This results in a seamless precisely controlled cast. When combined with the X-Ship gearing system, SVS Infinity braking provides an enhanced level of control over speed, distance, and weight that not many baitcasting reels can match. The Clam Psycho Shad is great for ice fishing applications because the internal design allows for a great rotating, natural swimming action that will take place even when casting or dropping it straight down. It also has a great natural back and forth motion that kicks in during the retrieve, so it’s extremely active during the entire casting cycle, even during stationary ice fishing. 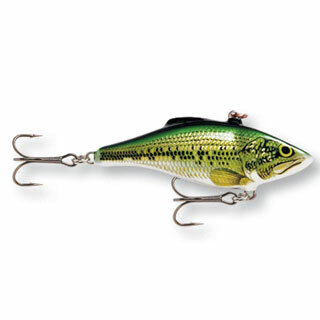 This, along with its natural, ultra-lifelike design and flashy color scheme, makes it an ideal swimming jerkbait for ice fishing, and this 3.8oz model is robust enough even for large quarry. 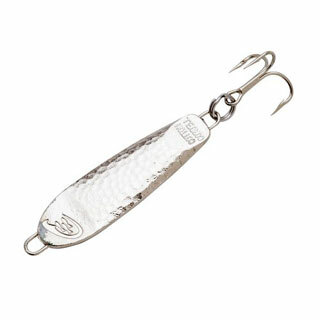 This lure from Rapala is the ultralight version of its Rippin’ Rap. It incorporates a natural profile with a hard-vibrating action that gives the impression of a very injured baitfish, luring in predators from long distances. It also incorporates a built-in rattle that sounds natural, yet projects quite a long way underwater, helping to draw attention to it. And while the standard Rippin Rap may be designed as a crankbait, the lightweight, tall profile of this lure allows it to mimic the presentation of a realistic fish even in stationary ice fishing applications. It’s also robustly designed and durable, with heavy-duty hooks and a paint job that’s designed to stand up to repeated strikes by large fish. In addition, its lipless design helps you achieve total control over your fishing depth. This Slender Spoon is designed by Custom Jigs specifically for ice-fishing. Unlike other spoons for open-water fishing which are designed to spin with casting and reeling action, these spoons are designed specifically for a “fluttering” presentation that happens naturally while sinking to the bottom of stationary ice fishing holes. Fishing with one of these spoons couldn’t be simpler. Rig it up (and feel free to add some live bait if you want), drop it down, and let it sink. Draw it up slowly, with some varied and inconsistent motions to help increase the rotation and spin to flash faraway prey. Rinse and repeat until you’ve caught all the fish you can carry. Simple, perfectly designed, and brilliant, we can’t recommend this little spoon highly enough. If you’ve had bad luck with other lures, this range of lures offered by Custom Jigs is sure to help you out. This jig by Berkley Powerbait is exemplary of a great ice jig. Unlike open water jigs, you don’t need a skirt to protect against weeds, and its bright color and minimalistic design are perfect for the “kicking” action used by experienced jigging ice fishermen. It’s also rigged to be horizontal, unlike some other jigs which stay vertical. Horizontality is ideal for ice fishing, as you want the jig to be resting on the bottom, and “kicking” the front of it with the hook exposed in order to draw in the fish. Paired with a worm-tail if you wish, and baited with live bait if you’re still having trouble attracting your quarry, this jig is sure to please if you’re looking to master the classic ice jigging techniques that ice anglers have performed over decades of fishing. There are some who say ice fishing is boring. We heartily disagree. It takes a certain type, sure, but once you’ve experienced the zen of sitting in the cold, bundled up and paying such close attention to your lure that an hour passes in the blink of an eye, you’ll be craving the return of fall and winter. And hopefully, this list of lures will help you better understand what to purchase and what to expect from the ice, whether you’re a rookie or an old pro who’s been jigging on the ice since age six.